Deciduous shrub/small tree, dense, shrubby, 8-10 ft (2.4-3 m) tall. 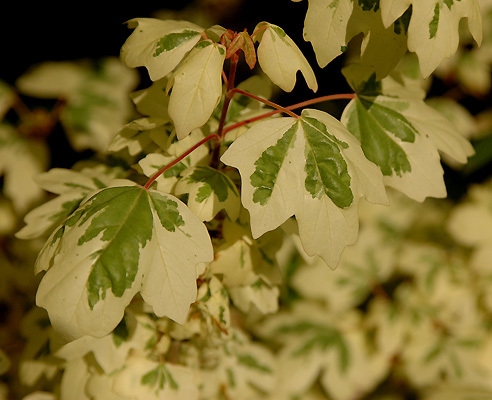 Leaves 3-5 lobed, variegated, green centers with very broad white margins, new leaves pinkish. Light to medium shade; may scorch, best without afternoon sun. Reportedly infrequently reverts to the normal green-leafed form. Hardy to USDA Zone 5 A chance seedling, developed by Andre van Nijnatten, Zundert, Netherlands, introduced in 1989.